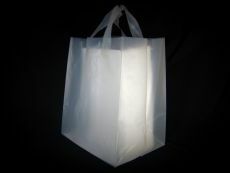 BioSelect Oxo-degradable Frosted Shopping Bags are an alternative to using plastic bags for take-out, grocery and retail purchases.Â While these bags are not 100% biodegradable or 100% compostable they are a less expensive option to the BioBag.Â Made at 2.4 mil they are exceptionally strong, with soft loop handles and send a clear message that you care about the environment.Â Standard sizes are small, 10x8x12 and xlarge, 18x9x18. BioSelect Oxo-degradable bags are made with high density polyethylene, a plastic, and an organic additive that helps the bags to break down in smaller pieces, but not it will not break down completely.Â BioSelect Oxo-Degradable Bags are not 100% biodegradable or 100% compostable. Is not biodegradable or compostable.